Sonam Kapoor has an agenda for the fashion industry or what? Or why else is she hopping from Paris to London to Milan to catch the Autumn-Winter 2012/13 showings at the fashion weeks? I know she has all the time as she got no movies to do but globetrotting and catching all the fashion weeks seems like the trait of a fashion addict. Sonam should try for a job with a fashion glossy. I don’t know if any would be keen to hire her as her knowledge on fashion is questionable. Wearing expensive labels doesn’t necessarily make you a fashion pro. My one-time chit-chat with her exposed her as she gaffed about Japanese labels like Comme des Garçons and it’s designer Rei Kawakubo. But yes I discovered from reliable sources that Sonam Kapoor is not invited by Cavalli or Gabbana to attend their shows. In fact she sends an E-mail request, which is like her resume to the fashion houses to secure an invitation. The E-mail talks about her filmography (a list of flop Bollywood movies) and also Papa – Anil Kapoor’s Slumdog Millionaire claim-to-fame. There are attachments of her snaps with Tom Cruise and of editorial shoots that she had done for Indian edition of Vogue, Harper’s Bazaar and other fashion glossies. 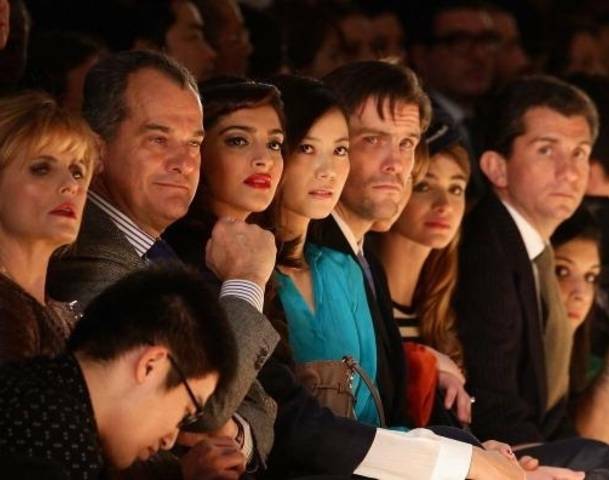 I guess that is enough of hard-sell by Sonam Kapoor to receive an invitation to the front-row. Once at the show she manages to get a picture clicked with the designer and immediately post it on Twitter for Desi media to clamour for it. Brevity is the soul of wit! Love the candour!!! Please watch my latest fashion & lifestyle show Style Addict on @UTVStars. Awaiting you feedback, either bouquets of compliments, or brickbats of critici’SMS’. “4C” Corporate Communication Consultants Corp.
Sure I will and give u honest feedback! I see nothing wrong with her trying to get invited to the shows. She’s just a girl doing her thing and trying to get somewhere. More power to her for having the gumption to do this!!! seem like sme sonam haer has js posted dis!! !uya…d info is fun to knw….agreed @thisnthat…:P bt yea…i see no problm if she sends mail to attnd a shw…!! !nobdy in d wrld knws vrybdy! !